Product prices and availability are accurate as of 2019-04-18 13:09:34 UTC and are subject to change. Any price and availability information displayed on http://www.amazon.com/ at the time of purchase will apply to the purchase of this product. Easily fits in your wallet (view larger). 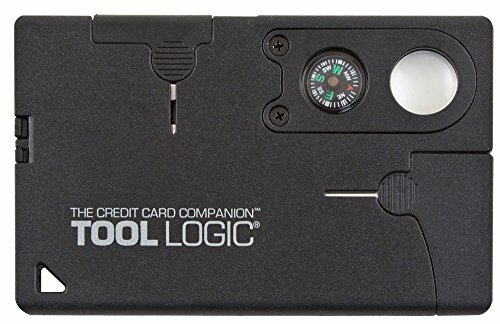 The Tool Logic Credit Card Companion (model CC1SB) is so light and slim that you'll barely know you have it, yet when needed you'll find it's amazingly useful. The 2-inch stainless blade is razor sharp and serrated to cut through even the toughest materials with ease. It also features a combination can/bottle opener, awl, 8x power lens and compass, tweezers and toothpick, plus inch and centimeter rulers on the back. At just 1.3 ounces, it packs effortlessly for travel both on and off-road. 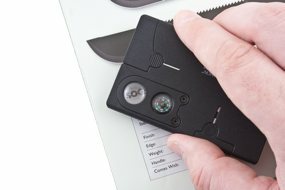 Keeping your knife clean, dry, oiled and sharp are the primary defenses against corrosion, wear, and potential injury. Be sure to clean the blade and handle after each use--however, do not soak your knife in water. A mild solution of soap and water should remove any dirt and debris that may have accumulated during use (avoid harsh detergents such as laundry or dish soap, and chlorine products). To remove any debris from inside the handle you can use a toothpick for any visible lint or dirt, or a Q-Tip for smaller amounts of dirt and debris. After cleaning or after exposure to moisture be sure to completely dry your knife blade and handle, taking special care with any sensitive handle materials. Use a soft cotton cloth or chamois and a small amount of moisture-displacing oil (such as WD-40 or 3-in-1), on the blade only, to prevent water spots and oxidation from forming. Fingerprints and weather are the primary causes of rusting or corrosion on a knife blade. 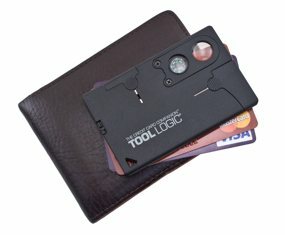 To keep your knife looking its best, Tool Logic recommends that you give your blade a light coat of oil after each cleaning, and prior to long-term storage. Be sure to also apply a Paraffin-based oil to the pivot point, which will not only keep the action of your blade smooth but will repel dirt and debris which could impede the blade's action. Magnifier and compass (view larger).